Assess The Return Of Your Investment In Training With EI Design’s Free eBook "Practical Approaches To Determine The ROI Of eLearning - Using Kirkpatrick’s Model Of Training Evaluation"
In this eBook, Asha Pandey (Chief Learning Strategist, EI Design) showcases EI Design’s integrated approach with a focus on choosing the right action at each stage that will impact the ROI of eLearning positively. This begins with the Training Needs Analysis or TNA phase and successively builds right up to the determination of its impact on business. 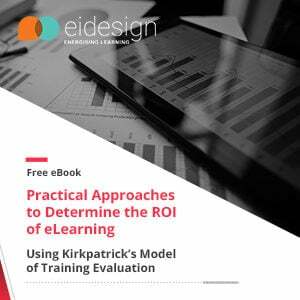 The approach uses Kirkpatrick’s model of training evaluation and Kirkpatrick–Phillips evaluation model of training to measure the training effectiveness and arrive at the ROI. This eBook provides insights, practical approaches, and tips that will help you in determining, enhancing, and maximizing your ROI on eLearning. Grab your FREE copy from here. That’s not all, EI Design is also hosting a webinar on the same topic on Thursday, December 6, 2018 at 11AM EST.